Home » Community and Society » Pets & Animals » Stingrays – worth more alive than dead! Stingrays are a common sight in the tropical waters off Ambergris Caye, and they are some of the main attractions for visitors, contributing to the millions of tourism generated dollars for the country’s economy. However, all that was not taken into consideration after a Southern Stingray was fished, dragged on shore, then left to die in the Boca del Rio Area. Marine conservationists found the dead animal on Tuesday May 20th and notified authorities about their finding. 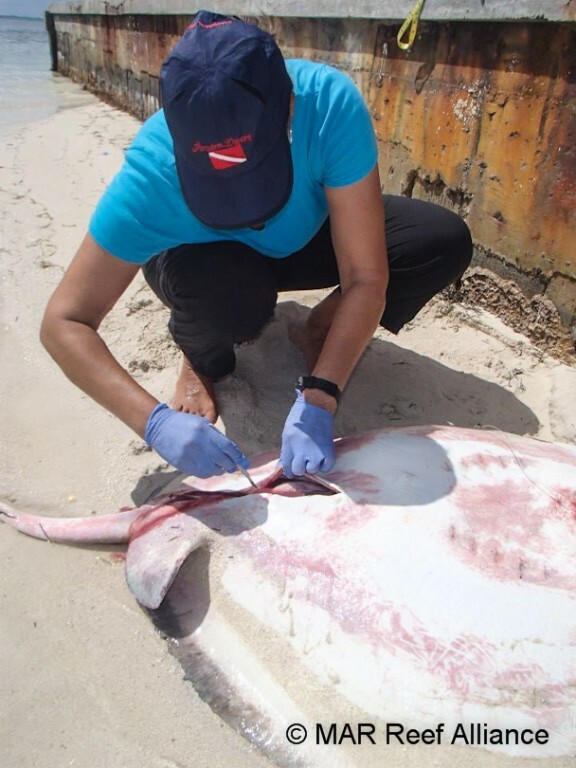 One person who has been studying sharks and rays in Belize and in the region and who responded to the call was Dr Rachael Graham, Director of MAR Alliance. 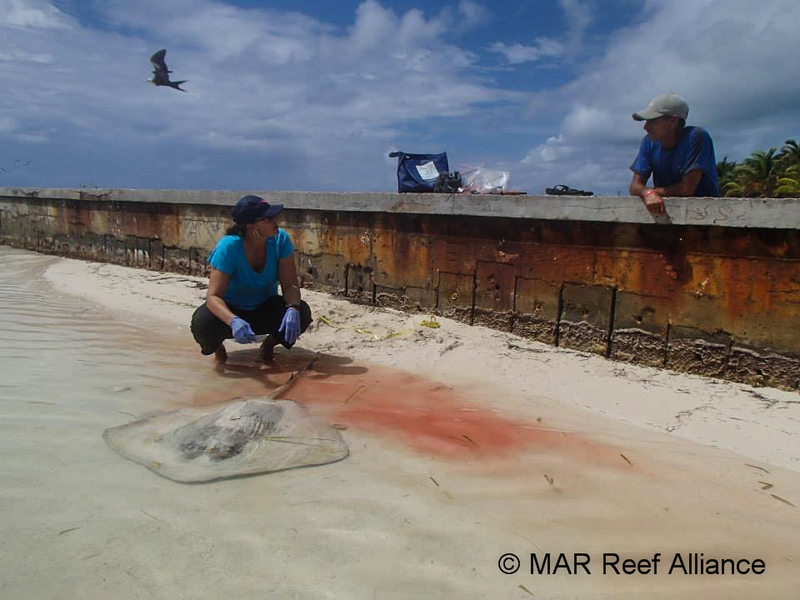 According to Dr. Graham, they were notified of the dead ray by Marine Biologists at Hol Chan Marine Reserve. “We found the ray on the sand in the general area near the bridge. 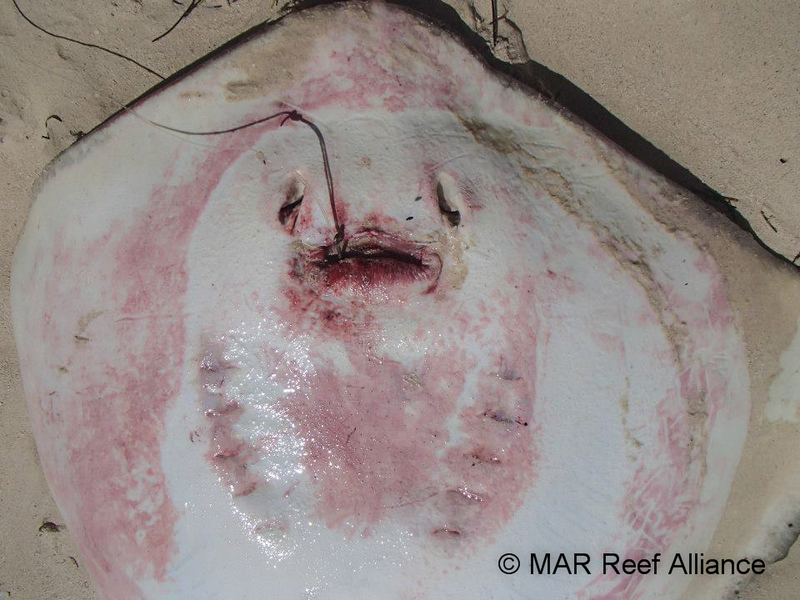 The ray was recently killed, perhaps in the night or early in the morning and she had a large J-hook lodged in her mouth with large piece of bait on it. Her spine was not broken and it did not appear that she was beaten or hit. She was just dragged ashore and left to die on the sand,” explained Graham. The animal was three feet wide and was a fully mature female ray. According to Graham, while they strongly believe the ray was accidentally caught, the marine animal should have been helped, unhooked if possible then released into its natural habitat. 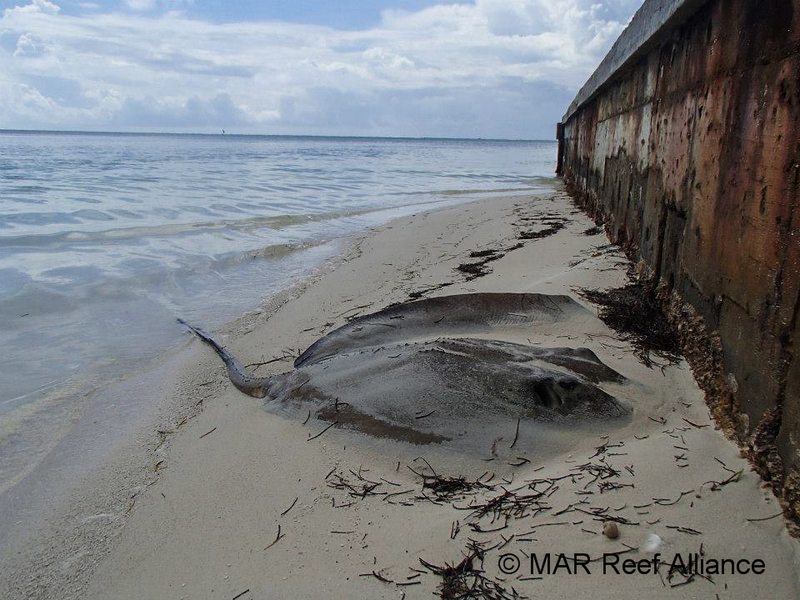 “People are very scared that they could be stung by the ray’s spine. If by mistake our fishermen hook a ray, what is best to do is to bring it on shore or to the surface and try and cut the hook. If you cannot cut the hook, try to cut the line closest to the hook and leave the hook; it will eventually degrade with the help of the natural elements. There is no need to worry about the spine because it is far away from the mouth but if they are worried about it, just throw a cloth or towel over it and that will keep it stationary,” suggested the Marine Biologist. These stingrays can normally grow to a length of six feet from one side of the disk to another and are considered one of the larger animals along the reef, and vital to our marine eco system around the island. Graham says, “This is one species of animals that gets you excited in the water when you visit to Hol Chan or Shark Ray Alley. It is one of the animals that makes the area attractive and contributes to the generation of millions of dollars in tourism revenue annually. 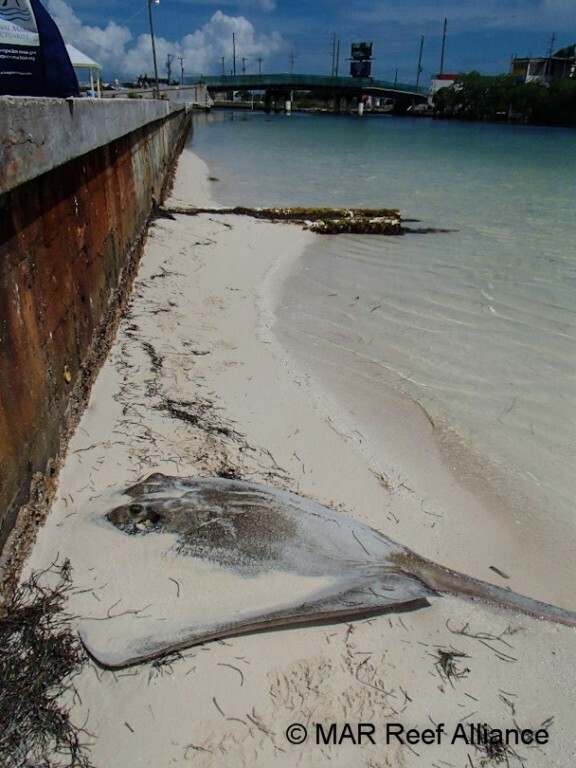 It contributes to our local economy and thus are worth more alive than dead.” While it seems that there are many stingray aggregates in our direct marine environment, little is known about them. Thus, they are considered data deficient, which places them near the “threatened” list. 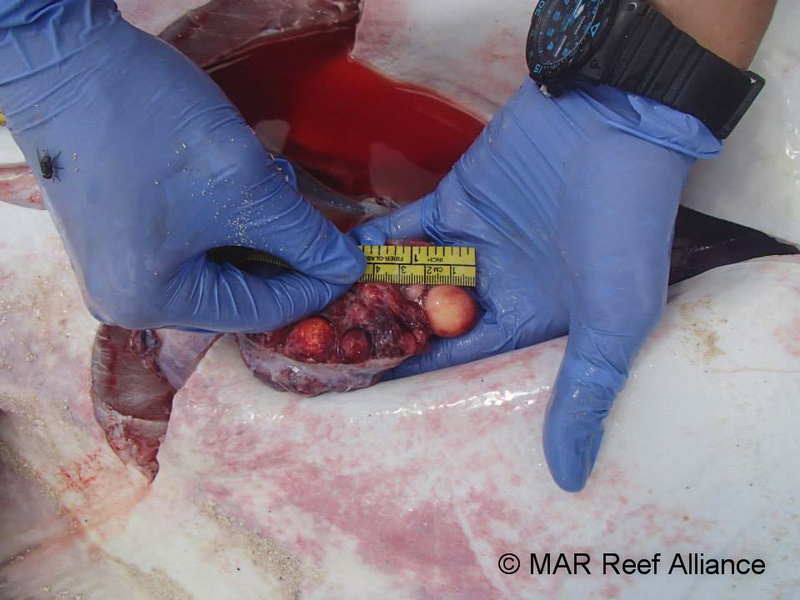 Biologist at MAR Alliance used the carcass of the ray for data analysis to study more about the southern stingray, are parts of it are being preserved to use for educational purposes. Costa Maya Presents: Miss El Salvador! !